"The size of the recall is big, but won't be a major problem for Toyota given the nature of the defect. Still, there will be some impact in the short term," said Huang Zherui, analyst at CSM worldwide. The recall includes 384,736 Camrys made with Guangzhou Auto between 15 May 2006 and 31 December 2008. 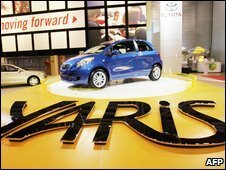 A total of 22,767 Yaris compact cars made last year with the same partner are also being recalled. The affected cars also included 245,288 Corollas and 35,523 Vios made in 2008 with FAW. Last month, rival Japanese carmaker Honda announced it was recalling 440,000 vehicles in the US because of an airbag defect.